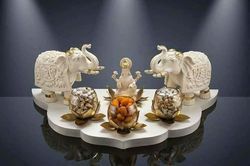 Our range of products include radha krishna under tree gift item, gaj lakshmi platter gift, honey comb bowl gift set, tulip bud rectangle shape ss platter, designer ganesha candle stand and baby ganesha with cushion gift. RADHA KRISHNA UNDER TREE GIFT is a 24kt Gold Platted Gift Item. Ideal Gift for Wedding Gift . Gaj Lakshmi Platter is available in Gold spray & 24kt Gold platted. 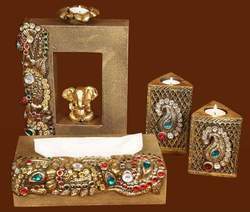 Gift Box Packing Add Royality to your home. Honey Comb Bowl set is available in 24kt gold platted. It enhances the decor of your home. Can be used for Gifting Purpose. TULIP BUD RECTANGLE SHAPE SS PLATTER is a beatiful platter for gifting of Dry Fruits, Sweets in all occassions. This platter can also be gifted your loved ones. 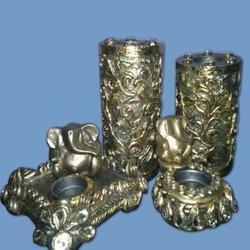 With in-depth domain expertise, we are engaged in providing the best quality Designer Ganesha Candle Stand. This candle stand is widely demanded amongst our customers for their stylish look and unmatchable pattern. Offered candle stand is crafted using high quality basic materials under the guidance of skilled craftsmen. 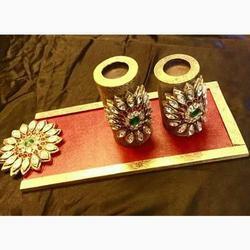 Our offered candle stand can be availed from us at reasonable price within a given time frame. 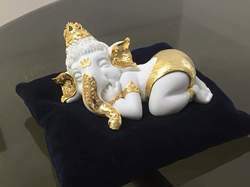 BABY GANESHA WITH CUSHION GIFT is 24kt Gold Platted Gift Item. It is the ideal gift for Diwali Gift, Baby Shower and many more. OVAL SHAPE TULIP BUD PLATTER is an ideal platter for gifting Sweets, Dry Fruits and etc in Wedding and in all occassions. 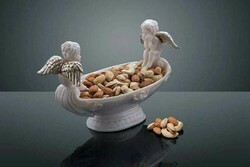 2Angel oval cupid bowl available in golden and silver platted wings. 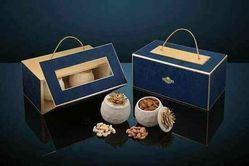 Can be used for Dry fruits gifting. Available in Gift box packing. Looking for Diwali Gift Item ?